The treatment of autism through art is a small but very effective method. There are specific advantages inherent in the act of making art that are uniquely beneficial to people with Autism Spectrum Disorder (ASD). Another very common symptom is hyper (or hypo) sensitivity to the physical world around them, through touch, hearing, or sight, and this often contributes to the above behaviors. The perception of autistic children of being "violent" has less to do with anger and a desire to hurt as it is simply an attempt to communicate through an alternative method since the "accepted" methods don't seem to work. One of the common methods of treating autism is through "talk therapy" under the direction, usually, of a team of workers who use verbal strategies to help the child develop social skills necessary for independent existence. Art therapy (which is used for many other ailments besides autism, such as post traumatic stress disorder) takes a different, more environmental and physical approach. 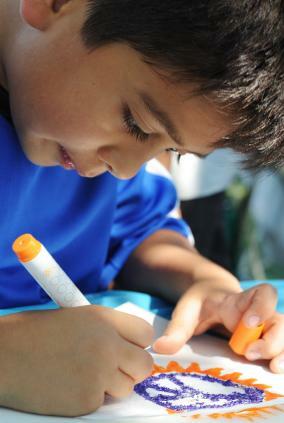 Possibly the primary benefit lies in addressing the difficulties with imagination caused by autism through art therapy. Art is, by nature, a very individual process, and the personal attention of an art therapist can provide a very hands-on and concrete way for the child to think abstractly and be creative. In addition, the creation of art usually lies within the constraints of a sensorally limited environment - crayons and paper,for example, or the simple tactile experience of clay on a wheel. The production of a piece of art within these parameters not only can help the child make progress but also provide, at the end, a tangible artifact of the process of treatment. Living with autism is very stressful, both for the child and the others in their family and support network, and art can be a very safe but effective way to express emotions, including frustration and anger. Most art therapists also have training in verbal counseling, and use the art in tandem with conversation to help feelings come out in productive and healing ways. Making art can also be considered to be a useful pastime for the autistic child, helping to develop self-reliance, pride in their work, and patience in the process of creating something. In the purely clinical sense, treating autism through art can help both in the developmental growth of a small child with autism (such as fine motor skills) as well as improving the visual-spatial discrepancies often present in children. The process of treating an autistic child through art is more than simply providing paper and paints. Art therapists meet with parents, other care providers, and the children themselves to create specific and attainable goals for their therapy sessions. Then the proper art activities and materials are selected for the plan of treatment. Finally the art therapist becomes the lead motivation in the therapeutic sessions, motivating the child and guiding where necessary. While the long-term goal is for the child to become self-sufficient, the process is often one of making art with the autistic child, using it as a concrete method to encourage greater communication, friendship, and trust, as well as modeling behaviors appropriately. When the clay and crayons and beads and glitter have been put away, the art therapist then evaluates the progress of each session and plans the next step, again in conjunction with the child's support network. The use of art therapy to treat autism is a long-term process, as autism is incurable (but improvable). Two very useful resources to find out more are the websites Art Therapy and Autism as well as Autism Teaching Tools. Many more are available through a Google search of the web or through websites such as LoveToKnow.